On this coming September 20, 2012 our very own Philippine team is set to face the team from Chinese Taipei inside the hard court at Ota Gymnasium in Tokyo, Japan. 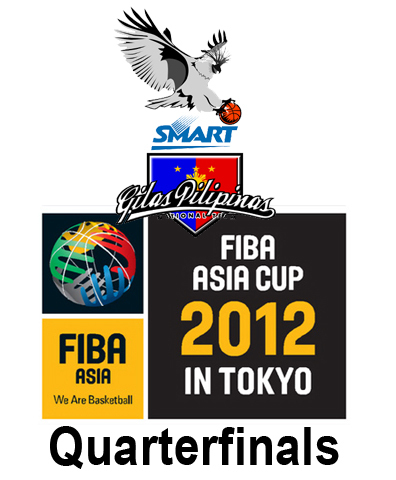 They will face their opponent country at around 2:30pm on Thursday for the quarterfinals of FIBA Asia Cup 2012. Their game against Chinese Taipei will be the second game match on that day's event. There will be a four game match that will be played by 8 different countries for the Quarterfinals, which Philippines luckily entered. According to Smart Gilas Pilipinas' head coach, Chot Reyes, the concentration of the team is more higher now than it was before, that is why he is very much positive on his team's determination on this event. Meanwhile, I have already prepared a table wherein the scores of Smart Gilas Pilipinas and Chinese Taipei will be posted continuesly as the game is running. Update on the scores will be posted every end of the quarter. Philippines Win against Chinese Taipei! For more details and update about this upcoming game event of the Philippine Basketball team, you may bookmark this page, and or, keep browsing this site as I deliver to you the latest of FIBA Asia Cup 2012 Quarter Finals. You may also share this post to your friends on Facebook, Twitter, Google+ and Pinterest so they too may be updated. Thank you. Comments or suggestions about "Smart Gilas Philippines vs Chinese Taipei in FIBA Asia Cup 2012 Quarterfinals Game Result" is important to us, you may share it by using the comment box below.